The meningitis vaccine helps growing kids stay protected against meningococcal disease, which can lead to bacterial meningitis. The vaccine does not typically cause an allergic reaction or any other severe side effects. Reactions to the meningitis vaccine may include skin irritation and slight fever. For children who have not yet received the meningitis vaccine, it is a good idea to seek it out before the school year starts. This allows time for your child to recover, if they do show any signs of an adverse reaction to the vaccine. Meningococcal disease is a serious illness that leads to meningitis, an infection of the spinal cord and brain. It’s highly contagious through person-to-person contact and can cause severe disabilities or death. Meningococcal disease is caused by the Neisseria meningitidis bacteria. Infants under one year old, children between 16-23 years old, and individuals with weakened immune systems are at the highest risk of contracting a meningitis infection. The best way to avoid meningococcal disease is through prevention by receiving the meningitis vaccine. The vaccine is typically given in two doses (the initial and the booster) to children between 11-12 years old, and with a booster administered at around 16 years old. Kids between 13-18 years old who have not been vaccinated are recommended to receive the vaccine as early as possible. Adults who have not been vaccinated can receive the vaccine at any time, and they should especially consider it if they plan to travel abroad. Usually, only one dose of the vaccine is administered for adults, but a booster may be recommended for individuals at risk. When Should the Meningitis Vaccine Be Avoided? Your child’s healthcare provider may decide against giving the vaccine if your child is currently sick, previously experienced a severe allergic reaction to the meningitis vaccine, or has a history of Guillain-Barré syndrome (a disease affecting the nervous system). It is highly recommended that all healthy children receive the meningitis vaccine to help avoid this preventable yet devastating disease. 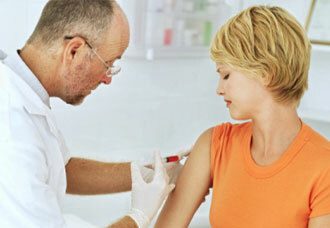 FastMed Urgent Care provides healthcare for almost every need, and some of our locations offer the meningitis vaccine. At FastMed Urgent Care, our mission is to positively impact the lives of our patients and their families. Walk in and let our medical professionals provide the compassionate, quick, and affordable care you need. We accept most major insurance plans, including Medicare and Medicaid. Contact FastMed Urgent Care to learn more about the meningitis vaccine and any other healthcare questions you have!